Midfielder Kevin-Prince Boateng has been undergoing treatment this week for a recurring knee problem but will be fit when Schalke 04 take on VfB Stuttgart on Saturday, hoping to launch a much-delayed attack in the Bundesliga. Boateng's surprise arrival at Schalke in September raised fan expectations but the gifted midfielder's knee has continued to be a source of concern. He was ruled out at short notice for Tuesday's Champions League 0-0 draw at Steaua Bucharest before leaving Romania for treatment in Munich. "Kevin did not have problems in the past few weeks," Schalke sports director Horst Heldt said after Boateng's departure. 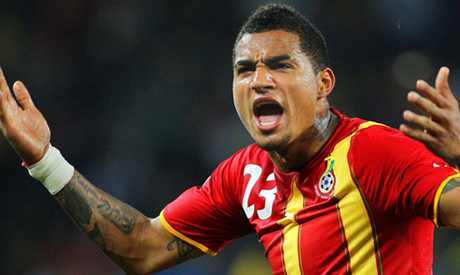 "He was two weeks with the national team (of Ghana) and there his condition could not be monitored. He left Bucharest early to get treatment in Munich." Heldt, however, said Boateng would be fit for their league game against Stuttgart when a victory would ease some of the pressure on coach Jens Keller, especially after his team squandered a two-goal lead last week to draw 3-3 with Eintracht Frankfurt. With more than half a dozen players currently on their injury list, including striker Klaas-Jan Huntelaar and central defender Kyriakos Papadopoulos, Schalke would have problems compensating any other absence, especially of Boateng. "The statistics regarding his knee demand constant checks but Kevin has already given the green light for the game against Stuttgart," Heldt said. "He will be ready to play, 100 percent." Schalke, who can still advance in the Champions League with a win over Basel in the last matchday later this month, are in sixth place in the Bundesliga on 21 points, 14 off leaders Bayern Munich. Stuttgart are equally desperate for a win, having bagged just one in their last six games to drop to ninth in the league. "We still need to work on things," said Stuttgart midfielder William Kvist. "We are still lacking organised pressing and finetune the plays in defence and offence. A few percent are missing everywhere." Leaders Bayern Munich can extend their league-record unbeaten run against lowly Eintracht Braunschweig while Borussia Dortmund will seek to bounce back against Mainz 05 after two straight Bundesliga losses, including last week's 3-0 defeat to Bayern. Second-placed Bayer Leverkusen, still licking their wounds after a 5-0 demolition by Manchester United in the Champions League on Wednesday, host Nuremberg.